I've been doing lots of research on how to obtain a truly free credit score. I am happy to stay that I found couple spots. Read full article. Before I share my findings, I'd like to remind that there is a difference between credit score and credit report. I won't give you all similarities and difference, but will briefly explain. Credit report tells you number of accounts you have, amount of debt you have, and much more details like your credit limit and if you have any collection against you. I am sure you know that government allows you to check your credit report from three different credit bureaus (Equifax, TransUnion, and Experian). Keep in mind that you can check each once a year. If you want, you can divide them in a year to have ability to check your credit every four months. Here is the government web site for credit report check. Now here is what I didn't really like about that way of checking. Let's say you are working towards getting a better credit score or if you are trying to reach a specific credit score to obtain a house mortgage. With credit report, you won't get a credit score. Most credit score agencies charge between $10 - $15 a month. I found two agencies that will do that absolutely free. Only drawback is there is some advertisement on their web sites (or apps). I am sure you heard of Credit Karma all over TV advertisement. It took me under 5 minutes to register and obtain a credit score from Credit Karma. What I loved about them is that you can use it on your computer, or get it on Android or iOS Device. I mostly use it on iPhone. I also enjoyed the friendly menu. On top of credit score, you get information on number of cards you have, amount of debt, collection, and your credit card utilization. Credit Karma uses TransUnion credit bureau. What I also liked about Credit Karma is that it updates every 7 days. 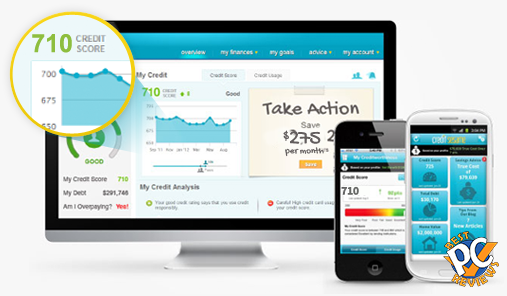 Now you are probably excited about free credit score (and pretty much free full credit report). Keep in mind though, this is only TransUnion. There are two more bureaus, the Experian and Equifax. Each of these bureaus may have slightly different credit score on your name, so more you know, better you are prepared if you plan to use your credit score in a nearby future. I've been looking to see if there is another free way to check credit score for another credit bureau and was happy to find one more. Second agency I found is called Credit Sesame. This one works with Experian bureau. As with Credit Karma, you will get some advertisement, which I myself do not bother. As with Credit Karma, on top of a regular credit score, you'll get some credit reports. What I did not like with Credit Sesame is the interface for iOS and Android did not appear to be friendly at all, but it was still easy enough to see my credit score. Credit Sesame has a very friendly interface for desktop version. Another issue on Credit Sesame, is I heard that once you signed up with CreditSesame, you will receive some advertisement via email. I would recommend you to use a good email service like google and block all spam you get. Unfortunately, I was not able to find a truly free credit agency that works with Equifax bureau. Keep in mind that when I say free, I mean that you don't even have to write down your credit card. All you need is know basic information about yourself and a social security number. Thanks for reading my article. If you encounter a free equifax credit score agency or any absolutely free credit score agencies, feel free to write them below at the comments section. Also let me know if you have any questions by submitting a comment below.